It’s swimming pool restoring time… again! Much sooner than expected. My swimming pool was originally plastered with pebble. While it was really beautiful, it was almost impossible for us to keep spot free. We had the pool made in 2001 and it was gorgeous. Unfortunately a small metal cap from a torch we had placed near the pool, ended up on the bottom of the pool, without us noticing. When we saw it, there was a brown rust ring on the pebble. 13 years later, that very same rust spot was still there. I guess it mus have been absorbed deep into the pebble, because I tried everything to remove it. More spots appeared over the years, and eventually we found the pool to be so ugly that we decided to paint it with epoxy paint. I drained the pool, and noticed that the surface was somewhat deteriorated and rough. That’s probably to be expected after 13 years. I scraped off loose pebbles, and grinded to get a smooth surface on the worst areas. I bought an high build epoxy paint called Epoxy Pool Paint IG-4000 from INSL-X. 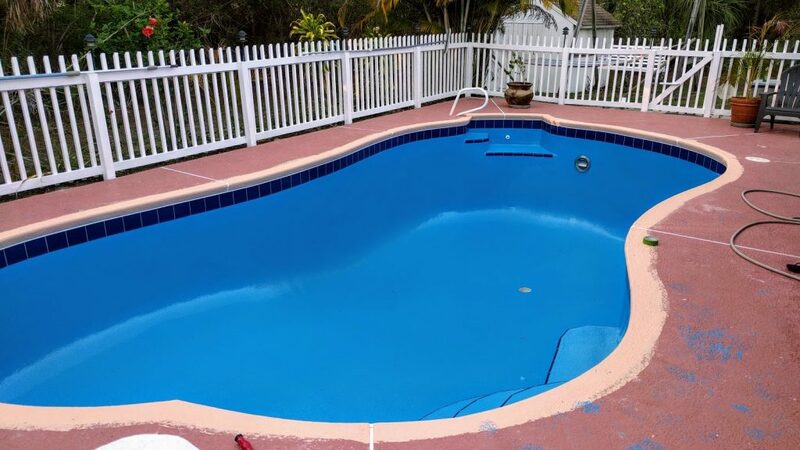 The pool looked great after painting, but it only lasted about 3 years. So, I didn’t really plan to do a repaint. The pool was leaking and I knew it had to be somewhere behind the waterline tiles. The leak stopped whenever I re-grouted, but started leaking again after a while. So I only wanted to replace the tiles, fix whatever leak was found underneath, and then spot paint below the new tiles. 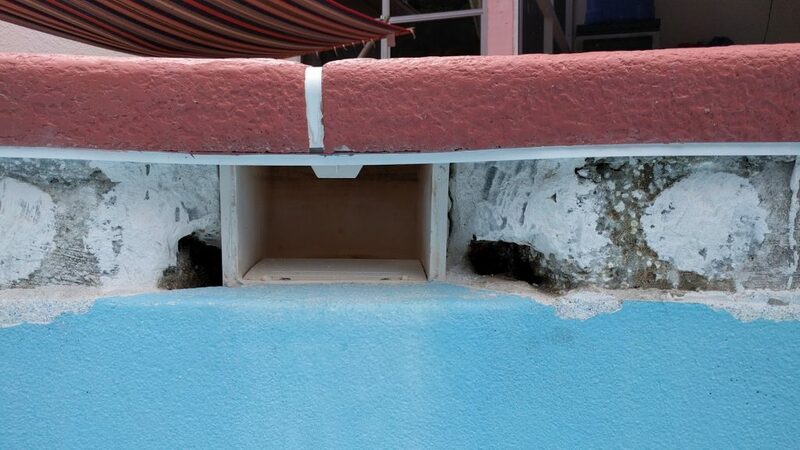 I removed the tiles and found a couple of huge holes around the skimmer. I chipped it out good, cleaned with PSP, acid washed and cleaned with PSP again. Then I fixed the holes with Cement All. That worked very well. Make sure to follow the instruction and keep it wet so it don’t crack. 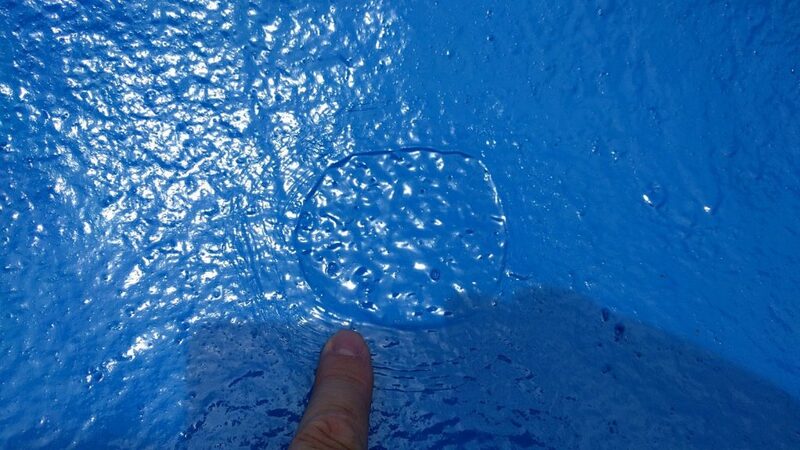 Now when the pool was empty, I unfortunately also notices that the 3 years old INSL-X epoxy paint was deteriorated in different areas so I put the diamond cup wheel on the angle grinder and went over these spots as much as I could. I bought solid color tiles in Lowes. No way I would pay $5-7 each. I hope I will not regret that. It should be ok here in Florida, where freezing isn’t an issue. For thinset I used ProLite from Home Depot. That was recommended in the question/answer section by the manufacturer. For grout I used regular Polyblend, which is a good polymer fortified grout, also from Home Depot. Now to the paint! I obviously did not want to buy INSL-X epoxy paint again, so I decided to go with Pool Guard from iPaint.com. It comes with a 10 years warranty, so it better last this time! It was some tough stuff to roll on. I hope it is as durable as it seems to be at this point. 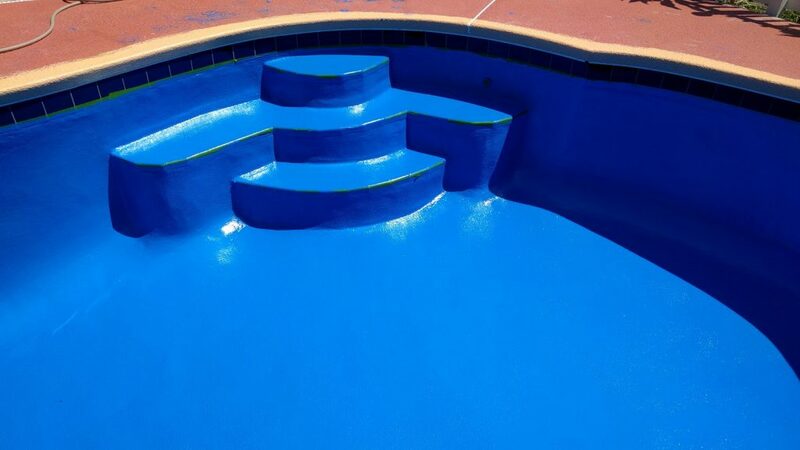 The pool looks like it is covered in a layer of hard plastic. Finally done painting. 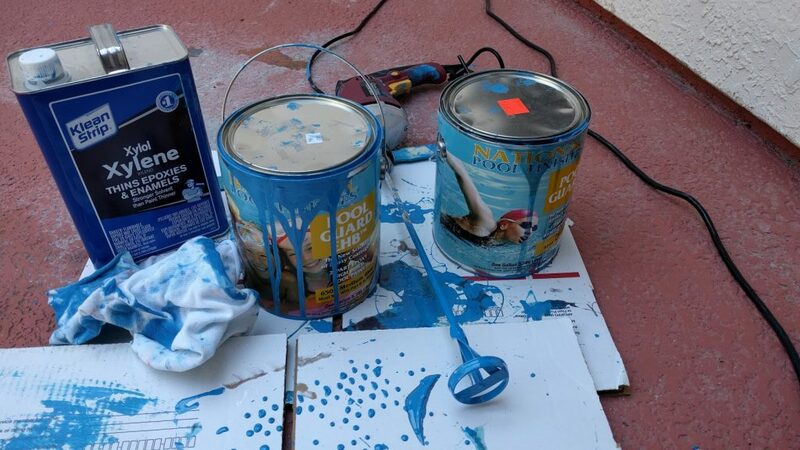 Next up, painting pool deck. Today it’s 05/13/2017 and I haven’t filled the pool yet. I have to go out of town, and I want to be around to keep the chemicals in balance after it is filled. So I will probably wait until the end of this month. That will definitely give it plenty of time to cure. Ok, it’s 06/02/2017 and I am back home again. Unfortunately I noticed 2 big blisters so I had to cut them out and repaint. Now I have to wait another 5 days before filling the pool. The blisters was in an area where I had patched the pool surface before painting. I do not blame the paint for this, because the patch concrete material, was actually stuck to the paint and came off with the paint when I cut it off. The epoxy was layered very thick and was incredible tough and strong when I pulled and twisted the patches I cut off. It’s no biggie and caused by the patching material below. Now I just hope no more will appear after I fill the pool with water. I will follow up in this post and let everyone know how it goes and how long it will last.